El Questro Wilderness Park, one of Australia’s most spectacular destinations in far north Western Australia, has reopened for the 2014 season offering a range of new experiences on this million-acre property. For the first time this season a Cessna 210 aircraft will be based at El Questro Station for the exclusive use of El Questro guests offering scenic flights up over the Kimberley coastline, over the Bungle Bungles and waterfalls and gorges. Operated by Kimberley Air Tours, guests will be able to choose from a two-hour Bungle Bungle and Lake Argyle Scenic Flight ($465 per person), a three-hour 20-minute Mitchell Falls and Kimberley Coast Flight ($765 per person) and a two-hour 20-minute King George Falls and Kimberley Coast Flight ($499 per person). Guests can also arrive in style at El Questro with scenic aeroplane transfers from Kununurra Airport to El Questro. The Bungle Bungle and Lake Argyle Scenic Flight takes guests over the awe-inspiring striped bee hive domes and gorges of this 350 million year old icon. One of Australia’s natural wonders, the World Heritage Listed Bungle Bungle range is a unique sandstone formation dating back 350 million years. This two-hour flight from El Questro’s airstrip takes guests first over Lake Argyle and the Carboyd Range. As the aircraft circles overhead, guests will be able to see the Gibb Face, the famous Cathedral Gorge and Piccaninny Gorge, the longest and deepest in the range. On the return journey to El Questro, guests will fly over the Argyle Diamond Mine, the largest producer of pink and coloured diamonds in the world. Meanwhile, guests with their feet firmly on the ground can take part in a new Tag-Along 4WD Tour following the Cockburn Circuit. A 133km round trip from the Gibb Road and El Questro Station driveway turnoff, the Cockburn Circuit is the most scenic of tracks at El Questro, encircling the Cockburn Ranges and allowing drivers to see spectacular scenery on a variety of different terrains. The cost is $450 per vehicle with a maximum of four people travelling. At Emma Gorge Resort guests can enjoy a new daily afternoon Kimberley High Tea with a range of treats to choose from including smoked salmon sandwiches, buttermilk scones with jam and cream and French pastries, and a selection of teas and coffees. The High Tea experience at Emma Gorge Resort is $25 per person, or $30 with a glass of sparkling wine. Meanwhile a range of new permanent Station Tents have been erected in the Black Cockatoo campground at El Questro Station allowing people to experience camping without having to bring a tent and all the associated equipment. The tents cost $149 a night and offer the weary traveller freshly made beds, bedside lamps, a fan, an outdoor dining set and a daily housekeeping service, plus they are close to all amenities and the Station Township facilities. El Questro Wilderness Park offers four distinct accommodation styles, each different in budget, ranging from the internationally acclaimed El Questro Homestead to Emma Gorge Resort, the Station Bungalows and Riverside Campground. In celebration of the 2014 season, guests staying at The Homestead can enjoy a 20% discount on a four-night stay, inclusive of all dining and beverages, selected touring and El Questro Wilderness Park Permit for two. Prices start from $1,575. Guests staying at Emma Gorge Resort can enjoy a special rate of $279 per room, per night for a two-night stay, including free buffet breakfast for two adults and children 12 years and under stay for free. This deal needs to be booked by 16 May. The Station Riverside Bungalows is offering three nights’ accommodation for the price of two for $328 per room, per night, from 7th April to the 25th May and from 22nd September to 25th October. Children 12 years and under stay for free. 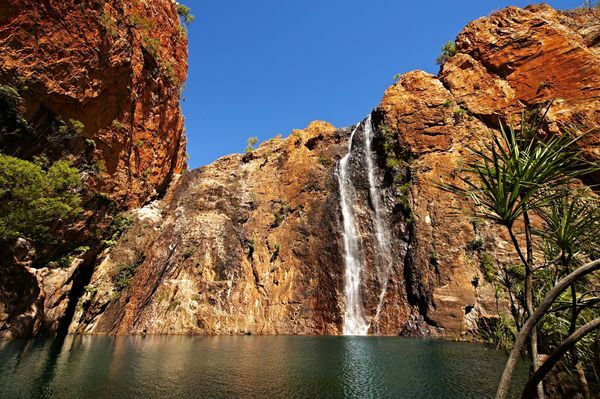 Located 110km from Kununurra, El Questro is a remote and rugged destination that promises the seclusion to explore this iconic part of Australia and the amazing wildlife that exists within its boundaries. Numerous tours are available throughout the season which runs until 31 October each year. These allow guests to experience the area by 4WD, helicopter, horse and on foot – all led by expert guides. Full day fishing tours for the elusive local barramundi are also available. El Questro Homestead reopened on the 1st April followed by Emma Gorge Resort and El Questro Station on 14th April. Emma Gorge closes on 5th October, following by the Homestead and El Questro Station on 26th October 2014. For reservations please contact www.elquestro.com.au or call 1300 233 432.